Now this is a storage facility! 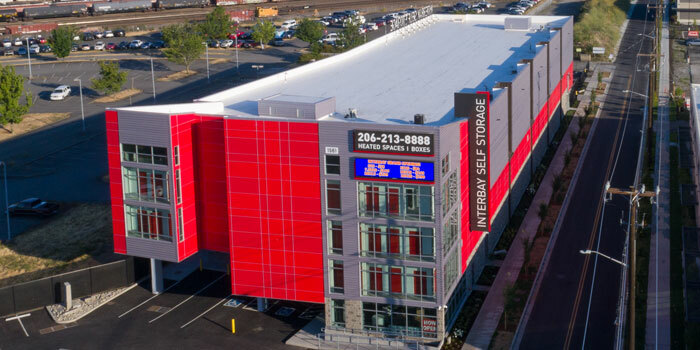 With it's modern design and impressive footprint, Interbay Self Storage doesn't have any problem catching the eye of passerby's on W Armory Way in Seattle. 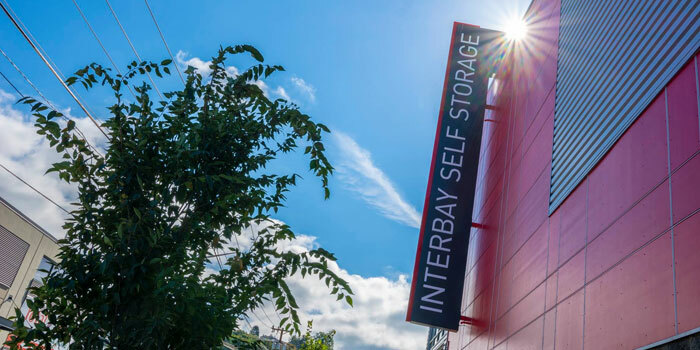 Our portfolio of work and experience working on other storage facilities throughout the PNW played a major role in Interbay reaching out to our team to help out with their sign package. During the quote process our teams were able to see eye to eye on the scope of the project and realized that we were the right crew for the job to help bring their visions to life on this one. A set of single faced, internally illuminated letters mounted to the roof and spanning across 80ft of roof line. A 38ft double faced, internally illuminated sign, flag-mounted vertically on the side of the building. A roughly 20ft wall mounted cabinet with internally-illuminated letters installed over the top of a 20ft exterior wall mounted Electronic Message Center complete with a custom surround to match the other signs and building. Given the size of the signage and the location of the building we naturally faced a few challenges that we needed to overcome to make sure this project was an absolute success. By the time Interbay reached out and brought us into the project, some work had already been done on the sign design front. 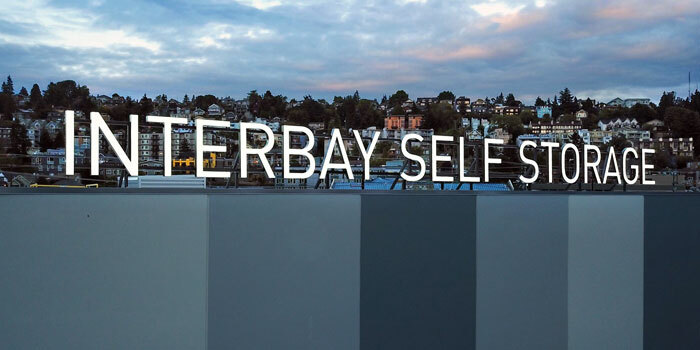 They had partially designed some of their signage so we needed to interpret the work that had been done and build upon that to achieve the full scope of Interbay's vision for the sign package. Due to the fact we weren't involved in some of the earlier phases of the design we ran into a few minor discrepancies between our set of architectural prints and those of the onsite contractors. This resulted in our team needing to do some unplanned welding on site, which was unexpected but nothing our team couldn't handle. Another key challenge was determining the best way to maximize visibility of the signage. 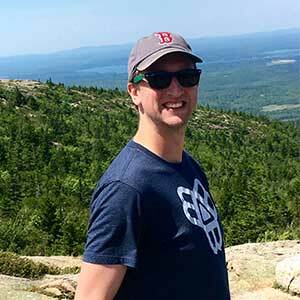 Not only from a coding and permitting perspective but also from an aesthetics and design standpoint. Originally we had considered and worked on designing a monument sign to anchor the entrance of the facility. However, after further review we realized that a better option might be to elevate the signage with an exterior wall mounted EMC (Electronic Message Center). We were able to create a custom surround to seamlessly integrate it into the facade of the building, which allowed us to maximize the visibility of the EMC messaging while also maintaining the clean and modern look of the rest of the building and signage. Positive and productive communication is always a requirement when working on a project of this scale. Although we faced a few little hiccups with the architectural site plans, all parties involved were able to maintain excellent levels of communication throughout the entirety of the project. The excellent communication during the early design phases set a great tone for the project and transitioned all the way from fabrication through to installation. From the GC and owner on the customer side to sales, design, fabrication shop, install crew and project managers on our side, their were a lot of people involved in bringing this project to completion. 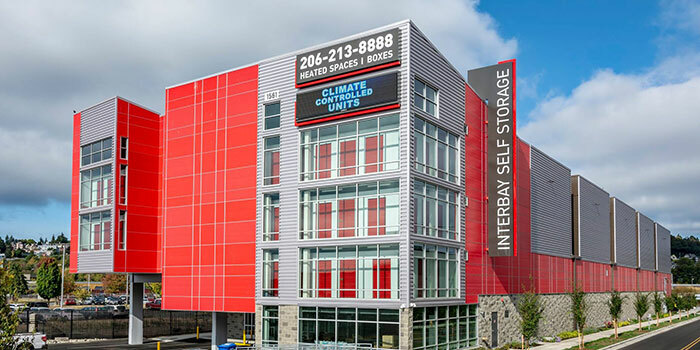 Interbay's parent company, West Coast Self Storage was also involved in providing feedback and direction when it came to the decisions involved with the sign design and placement. With all of these parties involved it was a necessityto have everyone on the same page and working together towards the same goal. Everyone's ability to collaborate and work as a team played an integral role in this projects success. 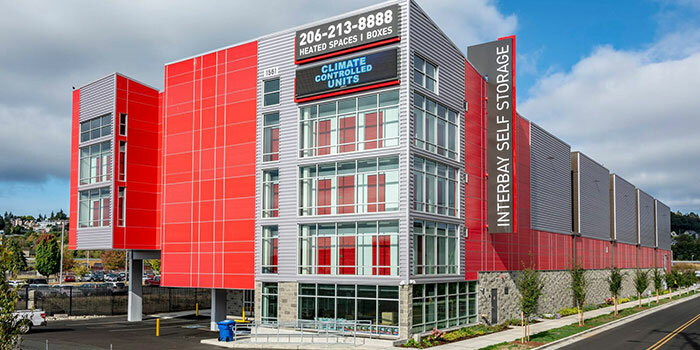 Having worked on a number of self storage facilities in the past, we are very proud to add Interbay Self Storage to our portfolio of work. The thought that went into the design of this facility made it an exciting one for us all to be a part of. The design, size and placement of the signage resulted in a comprehensive and visually engaging effective sign package. 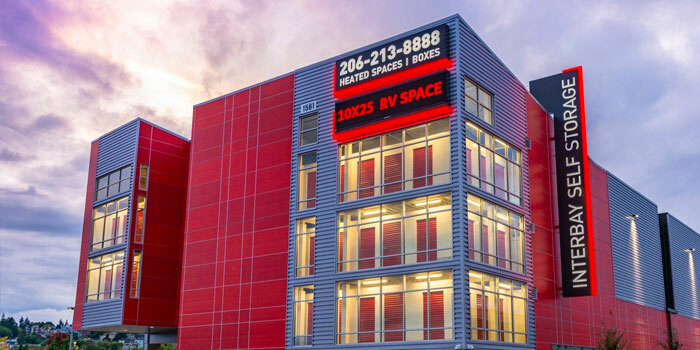 Working with signs of this scale never gets old and we can't wait for the opportunity to do more work with the crews at Interbay Self Storage and West Coast Self Storage in the future!